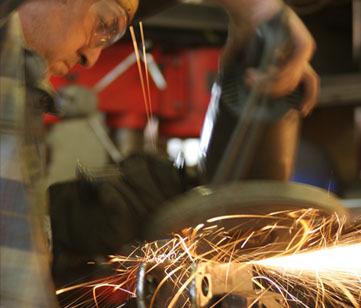 Rylance Limited employs two blacksmiths, two trainee blacksmiths, three metal fabricators and a painter. A large project will involve a team of people, each bringing an expertise in one or more phases of the design, build and install process. Every item produced is grounded in accurate measurement, skilful manipulation of using a mix of traditional techniques and modern tooling, and an absolute commitment to making things properly. We don't cut corners and we don't use sub-standard materials. We do, though, continually look for ways to improve and extend the range of techniques employed. Inevitably the workshop can be a noisy and frenetic place, especially when several large machines are in use at once. There are a couple of water-cooled forges, a large pneumatic hammer, a TIG welder, a laser cutter band saws and pillar drills. We are not wedded to the nineteenth century, and if we can invest in tools that will produce better outcomes at a cheaper cost then we will. And this is backed up by a vast store of templates, finials, balustrade panels, newel posts, hooks, hinges, brackets, bolts and washers: a few of them dating back to the early days of the industrial revolution. If you want to see how things are done, just make an appointment: we would be happy to show you around (and provide a cup of tea).